Honor 10 specifications and design have been revealed online courtesy a new leaked banner. The Honor 10, likely to be the name of the next flagship smartphone of the Huawei sub-brand, is widely expected to launch at an event the company is hosting on May 15 in London. The official invite for the Honor 10 launch event had the caption “Beauty in AI,” suggesting the handset will have AI integration, likely in the camera as the invite has a GIF with the shutter icon closing to reveal the phrase ‘AI’. The recently unveiled Huawei P20 and P20 Pro smartphones also have AI integration for better photos, along with many other handsets in the market today. 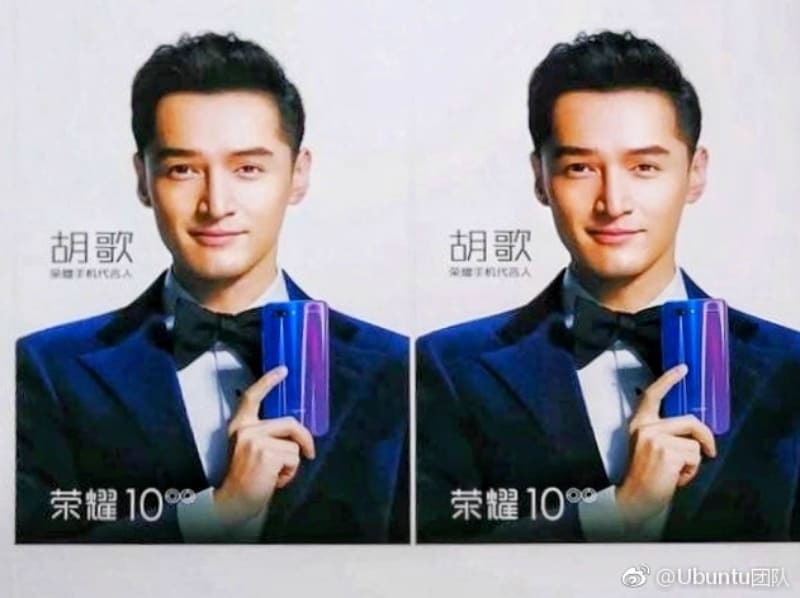 As per a new report, the official banner of the Honor 10 has apparently been leaked showing the design of the smartphone from the back; the phone is held by Chinese actor and singer Hu Ge. From the looks of it, the handset might come with a Huawei P20-like glossy Twilight 3D back panel. Additionally, the image does not show a rear-mounted fingerprint sensor suggesting that it might sport a front-facing one instead. A horizontal dual camera setup can also be seen in the banner. The report suggests that the front of the phone might sport an iPhone X-esque notch. Another such leak comes from what looks like an electronics store in China. The store seems to have a poster that reveals certain specifications of the Honor 10. According to the poster, the upcoming handset will be powered by an in-house Kirin 970 SoC, coupled with up to 6GB RAM and up to 256GB onboard storage. Apart from that, the phone is said to sport a 5.8-inch display, possibly with a full-HD+ (1080×2160 pixels) resolution. Interestingly enough, the poster also suggests a 100 percent screen-to-body ratio which is practically impossible. We will have to wait till the launch event next month to see what Honor has up its sleeves.